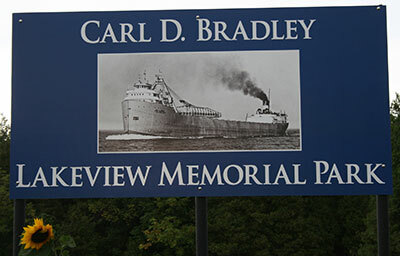 The SS Carl D. Bradley was a self unloading Great Lakes Freighter. Built in 1927 by the American Ship Building Company in Lorain, Ohio, the Bradley was owned by the Michigan Limestone Division of U.S. Steel and operated by the Bradley transportation line. On the evening of November 18th, 1958, after unloading a delivery of stone at Gary, Indiana the previous day, the Bradley was upbound on Northern Lake Michigan with water ballast when she encountered a storm with 65 mile per hour winds and 20 foot (6.1m) waves. The ship was about 12 miles (19km) southwest of Gull Island when, around 5:30 p.m., the hull began breaking in two. The first mate managed to radio three separate transmissions of mayday before the power lines aboard the ship were severed in two. An order was given to abandon ship but the Bradley sank before any life saving craft could be effectively launched. Alerted by a distress call, the United States Coast Guard Air & Surface Units and other commercial vessels searched for survivors through out the night and into the next morning. At 8:25 a.m. on November 19th, the US Coast Guard Cutter Sundew located the Bradley’s forward life raft five miles (8.0 km) northeast of Gull Island with two survivors aboard - First Mate Elmer H. Fleming, 43, and Deck Watchman Frank L. Mays, 26. 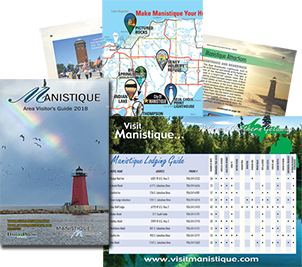 Throughout the night and the following days, the Sundew and other vessels recovered 18 bodies, many of which were brought to City Hall in Charlevoix, Michigan for family identification. In all, 33 crewmen lost there lives. In August 2007, divers John Scoles and John Janzen removed the “Bradley’s” bell and returned it to Rogers City, where it was restored. A memorial bell engraved with the names of the lost crew was placed back on the Bradley two days after the original bell was removed. The wreck site is located 160 degrees S E and 23 miles off shore from this point.